I made the second bag in the "Zip It Up. "class on Craftsy. This bag is called "Nickita." It was surprisingly easy to make and I consider it a complete success. The free motion quilting was NOT in the class instructions. She explains a much easier way to stitch the layers together....but I wanted to quilt it. So, I did. The colors are truest in this photo of my Nickita bag. I decided to make the handles with a completely different fabric that accentuates the blue bits in the feathers. 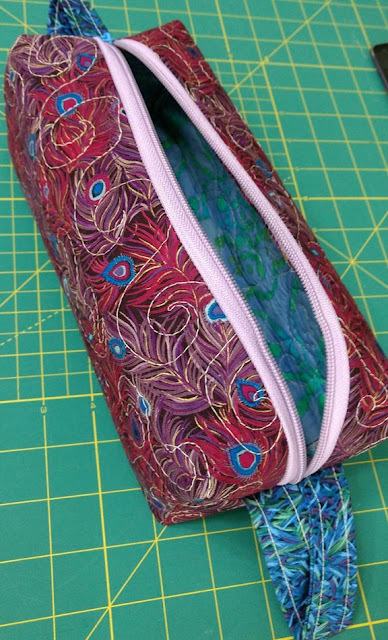 I also added a blue pull to the lavender zipper just to add a bit of whimsy. You can peek at the lining fabric in the open photo below. The colors are "off" a bit in this picture. I am thinking I will use this one as a shave kit when I travel. However, this would be a great bag to carry some sewing supplies with you for hand work, or to a guild sewing day. It may be a few days, but I want to make the Bendy Bag that is taught in this class too. If you click the link, you can see pictures of it. Love the bag. I have been wanting to make one similar just haven't sat down to do it. Very whimsical color combo....love it! Wait, is it Elton John? Holy moly, I was thinking Perry Como. Well, older either way. Love your bag, I am afraid of zippers, I have only put in two one when I was in middle school and one on my wedding dress, both were okay but still, I am afraid of zippers, the bag is lovely. I got the Elton John reference immediately because we are about the same age. My bags are still wonky, despite the same Craftsy class. I need to practice more. A great bag. 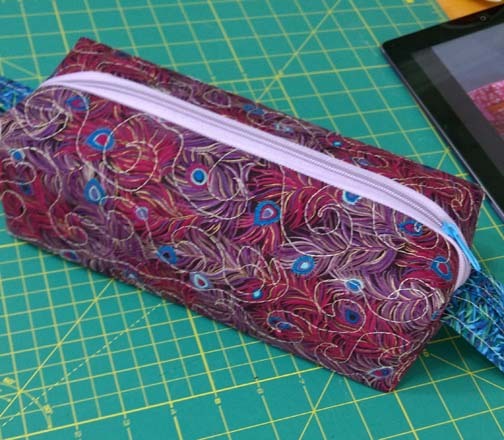 I can see using to carry crochet needles also :) I should look up the class, the sandwich bag I am using is wearing out! How was this bag to sew Gene? I have the course but haven't got around to making this one. How does it compare to the "Runaround Bag" from the same class?